In addition to our pop-up exhibition ‘From Rain to Loom’ on the Brompton Rd during London Design Festival (read more about that here) we are also super-excited to be involved with ‘In the Neighbourhood’, a pop-in design exhibition in north London curated by friends and neighbours Louisa Grey and Morgwn Rimel. In the Neighbourhood showcases the work of emerging local and international designers, artists and makers in two neighbouring residential settings - Grey House, an elegant Victorian town house and Blue House, a loft conversion within an old Methodist congregational hall. Grey House, featured here, is a warm, elegant and calm interior, decorated with subtle hues, natural materials and textures. The emphasis is on handcrafted furniture and accessories, and Stitch by Stitch textile pieces sit well with furniture from Mass Productions, Noorstad and Frama, bespoke window treatments from Nest Designs, rugs from London House Rugs, and travertine pieces from Studio Henry Wilson. Vases are by Natascha Madeiski and paintings by Tycjan Knut. Both homes feature botanical design by Urban Flower Co, sound design by Playlister and Urbanears, and Utopian scentscapes by The School of Life. Complimentary 20-minute Energy Healing Head Clearing Treatments are offered at Grey House. 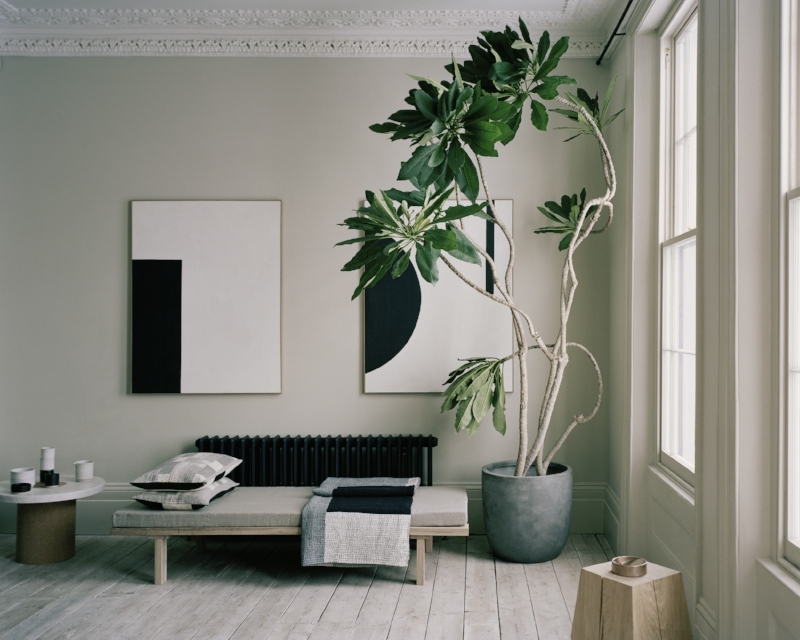 Louisa Grey is the founder and creator of interior design studio House of Grey. Morgyn Rimel is a multidisciplinary creative, cultural innovator and expert on wellbeing. In the Neighbourhood coincides with the London Design Festival, from 15 - 21 September. By appointment only, book your visit here. All photos by Rory Gardiner.